Marc Haendle at Ocean Independence will be hosting an Open Day on his listing for sale, the 31.12 metre sailing yacht Psyrax on Friday, 27 June between 4pm and 6pm in Marina Port de Mallorca. Psyrax was built by Dutch yard Van Dam Nordia in aluminium to a design by Robert Van Dam and delivered in 2005 as a cruising sloop. She accommodates up to eight guests in a master suite and double and twin cabins, along with a Pullman berth. 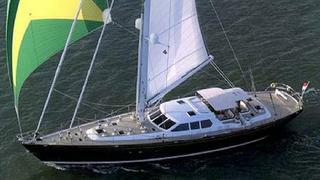 Her owner has spent more than €500,000 refitting her with a smart, modern interior. Further recent work has included a new paint job to the hull and superstructure, new mast and boom, an updated rig, new sails, new bow thruster, and a new Bimini top to name but a few upgrades. Under power, a 425hp Lugger engine gives Psyrax a cruising speed of nine knots, and she is asking €2,950,000.